Last four weeks I have worked on several features that would improve user interface in Artikulate. 4) allowing the user to change the font of the displayed phrase. The screenshot shows a view that a user have while learning a new phrase after the changes. You can see from the progress bar at the bottom that the user already have learnt correctly some words (green colour), expressions (blue colour) and phrases (orange colour). The user can switch between the words, expressions, sentences and phrases by clicking on the progress bar. 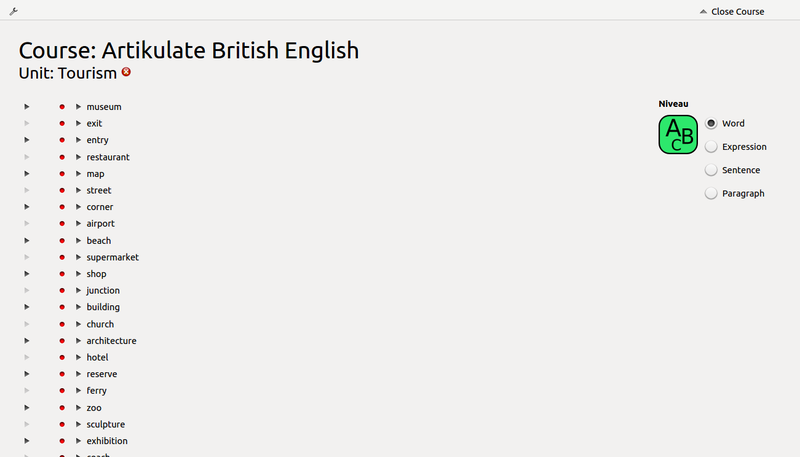 There are also two separated sections for media buttons: native speaker section and user section. The user section has a record and play button so the user can record himself and then listen to his own recording in order to compare with a native speaker one. I am currently working on implementing GHNS in Artikulate. So far the user in order to get the course data files had to manually clone git repository. This is not ideal and we would like to support downloading the courses within the application. Therefore I am trying to use GHNS (Get Hot New Stuff) library to accomplish this. Below there is a screenshot of the download window I have so far. Language data for Artikulate is growing. We currently have 19 units in basic course skeleton form which 18 are translated into Polish, 10 into French and 7 into Bengali. I have gathered some initial recordings so 8 polish units have recordings of male and female speaker. Also 2 French units have recordings of a male speaker. But we need more!!! If you are attending the Akademy this year you have a chance to contribute as well. There are two BoFs on Artikulate scheduled on Wednesday, July 17 organized by Andreas Cord-Landwehr (IRC Nick: CoLa) . If you are interested in attending please follow this link. Therefore my job with units is finished and I am moving to my new task: translating units into Polish and French and getting native speaker recordings. Each phrase needs to be recorded by a native speaker, so later on the user will be able to listen to it and compare with its own recording. I am now looking for Polish and French native speakers so if you fancy contributing to the project you could give me a shout. I am currently writing the contributor manual where it will be explained how to add new recordings to the program. This post is to explain to the readers more about Artikulate. 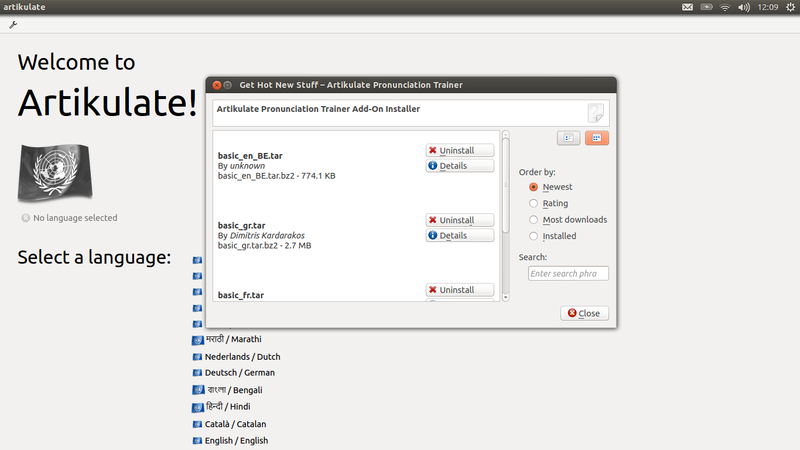 Artilkuate is the pronunciation trainer software for different languages. Currently supported languages are: French, German, Spanish, Italian, Dutch, Catalan, Greek, British English and American English. The user can choose the language that he would like to perfectionate and follow the units prepared for this language course such as: Tourism, Alphabet, numbers, sports, etc. In each of the units the user can choose between practicing words, expressions, whole sentences or paragraphs (2-3 sentences) which all together are called phrases. The phrases are pre-recorded by native speakers and the user can listen to them. The user can also record himself speaking the same phrase and compare how close he is to a native version. There is also an option of practicing a particular phoneme that the user has particular difficulties with. This all looks great!!!!! BUT most of the features are not ready so unfortunately you cannot use Artikulate yet…My job this summer is to make it work. The first task for me is to prepare course skeletons for the units. The course skeletons are written in English and consists of several units as described above. The units can be then translated to all languages available in the program therefore saving the work of writing the courses for different languages separately. The current units available in basic skeleton are: Numbers, Alphabet and Tourism. Artikulate team decided to add some more and my job is to add nine additional units: Family, Sport, Entertainment, Clothing, At the supermarket, At the doctor’s, Time and Dates, Weather, Countries and Cultures. We have decided that the whole basic course will have about 20 units so other team mates are working on the other units. Therefore my first three weeks I will work on adding the required units and writing contributor manual which will explain the user how to add more units and phrases…YES you will all be able to add some too! Welcome to my blog about Artikulate which is a FOSS pronunciation trainer!!! I will be assisting with first release of this software which was created to help you to polish your pronunciation skills in many languages available.